Nii Akwei Adoteye is a saxophonist, educator, producer, composer and arranger currently based out of the Washington D.C. area. He completed his Bachelor of Music degree – in Jazz Studies and Classical Saxophone Performance - at Christopher Newport University in 2008. There he was a regularly featured soloist in both jazz and classical ensembles. At Christopher Newport University, Nii Akwei won the concerto competition every year he was eligible to compete, while also gaining awards at state music conferences and the North Sea Jazz festival as a jazz soloist featured with the CNU big band. 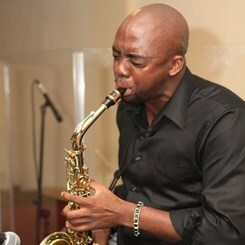 Nii Akwei attended the University of Miami to pursue his Master of Music in Jazz Pedagogy, graduating in 2011. While there, he was part of the Frost School of Music Studio Jazz band as they won the Downbeat Student Music Award for “Outstanding Graduate Large College Ensemble”. He completed a second Master of Music at the University of Miami, this one in Studio Jazz Writing, in 2013. While pursuing this degree, Nii Akwei took a leadership role as part of a 9 person staff running a digital recording studio. As part of this staff, he engineered over 75 tracking sessions for groups ranging from jazz duos to full studio jazz orchestras (with strings) and everything in between. As a composer and arranger, Nii Akwei was the winner of the ASCAP Foundation Herb Alpert Young Jazz Composer Award in 2013 and 2014. He has also received commissions to write for the Henry Mancini Institute Orchestra and the Frost School of Music. Request Lessons with Nii Akwei Adoteye today!